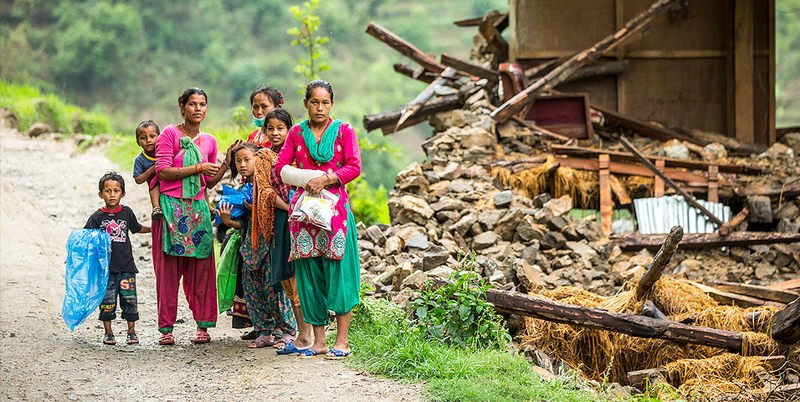 Many countries in Asia and the Pacific are at high risk of natural disasters, such as earthquakes, droughts, and floods, which result in loss of lives, livelihood, and property. Photo credit: ADB. Increased availability of data and computing power have made it possible to set parameters beforehand that will trigger insurance coverage for a variety of risks. New ways of using data are starting to revolutionize risk finance—the heart of the historically slow-to-change insurance industry. Pools of data and enhanced analytical skills are changing everything from the scope of coverage to the speed of claims payments to the types of products offered. For disaster insurance, risk data is correlated with the parameters of an event, such as temperature changes, wind speeds, and rainfall. This minimizes the need for loss adjustment and has enabled faster payouts. Using data analysis can enable the targeting of risk before insurance is even considered, leading to more dynamic risk financing. For example, modeling the effects of commodity prices is changing the way that energy companies construct their insurance programs. “Renew and walk away” is no longer the standard, as programs can adjust in real time. Consider a traditional coverage area such as natural catastrophes. Hurricanes, typhoons, earthquakes, tsunamis, and other disasters have been relentless in the past two years. One thing these phenomena have in common is that their severity can be measured and expressed with increasingly accurate data, including temperatures, maximum sustained wind speeds, acreage destroyed by fire, and seismic strength. The insurance industry has long modeled such risks using analytics to structure their own reinsurance protection. But the increased availability of data and computing power mean that more corporations are now doing their own analyses to correlate their risk with the parameters of an event. In response, what is known as parametric insurance coverage—using data to price risk, scope coverage, and pay claims—is becoming a more common solution for risk finance. Organizations used to see traditional insurance as a safety net—pay the premium, wait for an event to occur, file a claim, and receive payment. Only after tragedy struck did the hard work of adjusting the loss begin. For some businesses, the time between the event occurring and the payment can create a financial struggle. Parametric insurance changes this process by establishing parameters beforehand that will trigger coverage. For example, a contract may call for a defined payment if winds reach a threshold speed or if flood waters rise to a certain height at designated measuring stations. The coverage is then triggered by such a defined measurement being reached, rather than by an assessment of loss after the event. Similarly, the quantum of insurance payments can be agreed on in advance. It may be simple to calculate something like the loss of revenue if a single customer does not arrive. More complex is the calculation for how rainfall levels measured across a reference frame of six weather stations affect the chance of flash flooding in a data center—but it can now be done. Physical damage, supply disruption, power outages, loss of revenues. Wind speeds, magnitude, the Richter scale. Physical lockdown, business continuity issues. Loss of client data, lack of access to important IT systems, public perception. Data records lost or accessed; customer churn. Severe staff illness, supplier/contractor illness, travel disruptions. Transmission and distribution disruption, stock beyond salvage. Acreage destroyed within grid reference. Loss of revenue due to severe temperatures, lack of snow, loss of crops. Snowfall, temperature, days of rain. Misuses of brand, drop in sales, drop in share prices, loss of consumer confidence. These changes pave the way for faster payouts and faster recovery, as the policy is automatically activated when the criteria are met, and the payout pre-calculated, with no need for complicated loss adjustment. While parametric insurance started in and remains prevalent for, natural disasters, other coverage areas are emerging. Nonphysical damage risks and less tangible assets can now be covered by correlating risk data with an objective parameter—for example the number of information records in a system or the number of visitors to a tourist attraction. Such innovative use of various indices is not a replacement for traditional insurance programs, but it can bridge protection gaps. Companies with a captive insurer are also showing increased interest in using parametric coverage in their programs. This changing insurance landscape indicates a mind shift in the entire underwriting process and changes in risk management best practices. Above all, it means a company’s entire business strategy could be better-supported thanks to a greater understanding of available data. Traditionally, people look at risks after an event has happened; the rapid development of data analytics is making it easier to plan for risk. Parametric coverage is being used across industries, from agriculture to aerospace, and for a variety of risks. Over the past year, Swiss Re alone has seen requests for parametric coverage triple due to a greater understanding of how to customize cover based on a growing array of data sources. A hotel, a marina, or a banana grower, for example, will be able to start recovery virtually straight after a storm if the cover is activated. Competitors on traditional coverage may be at risk of waiting for their losses to be assessed. There is more granular data available to enable customized solutions. A wider range of indices is evolving with technology—from log books and record keeping to smart systems, location data, and satellite imagery. Smaller limits are now available, making the parametric cover more mainstream and, therefore, an attractive option for all, not just Fortune 500 companies. The nature of what is an insurable risk is changing, moving from dealing with tangible to intangible risks, which requires innovative treatment. As data innovations continue, the range of available risk finance options will only grow. Parametric coverage, for one, will increasingly be a consideration for any risk against which a company can apply an index. With the right data and technical skills, organizations can proactively map out their risks and exposures, leading them to understand their operations better, develop their strategies accordingly, and start the job of future-proofing. This includes getting to grips with all financial and operational risks that can cause interruptions, from cash flow exposure to threats to earnings. Put simply, it’s a matter of brainstorming the issues that stand in the way of success and overlaying that information with data. This article was adapted from content featured in Brink. C. Wertli and S. Harry. 2018. Data Is Revolutionizing Risk Finance—Here’s How. Brink. 8 November. T. Markovic and S. Harry. 2018. Parametric Insurance: A Tool to Increase Climate Resilience. Marsh &l McLennan Insights. Christian Wertli is global head of innovative risk solutions at Swiss Re Corporate Solutions. He has over 30 years of experience in insurance, reinsurance, and banking, and worked in London, Zurich, Hong Kong, Singapore, and the United States. Steve Harry is senior vice-president at Marsh Risk Analytics. He has 30 years’ experience in advising companies on risk finance and strategy, including structured placements, parametric weather, and the use of statistical models to drive insurance decisions.